Unemployed and low income women at the Mongolian Quilting Center, Ulaanbaatar, make many beautiful products, utilizing materials that are locally available including silk scraps obtained from a clothing manufacturer. Several items feature the Mongolian Ölzii motif, often painted on the doors of the gers (Mongolian yurts) and thought to bring long-life and prosperity to the occupants. In Tibetan Buddhism, which is practiced in Mongolia, the Ölzii symbolizes the universe and the never-ending cycles of life and death. If you are interested in purchasing any of the products depicted, contact Maggie to make an order. 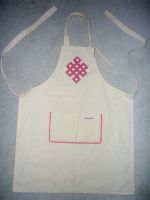 100% of the sales revenue is sent to the Mongolian Quilting Center. 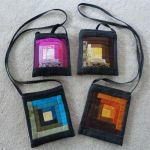 Availability and color choices are variable depending on how recently a shipment has arrived from Mongolia and what they send.